In 1972, Watergate was little more than an arraignment hearing in an obscure court in Washington, D.C. The popularity contest of politics that made Nixon so paranoid was yet to motivate a frenzied demand for twenty-four hour news cycles that now, sadly, seem here to stay. In this weekendâ€™s film recommendation, Michael Ritchieâ€™s The Candidate, we glimpse into the prescient fears of those who envisioned how pandering to the media can warp a political campaign, from a heartfelt plea inspired by an authentic sense of mission, to an insipid display of pablum of the lowest order. 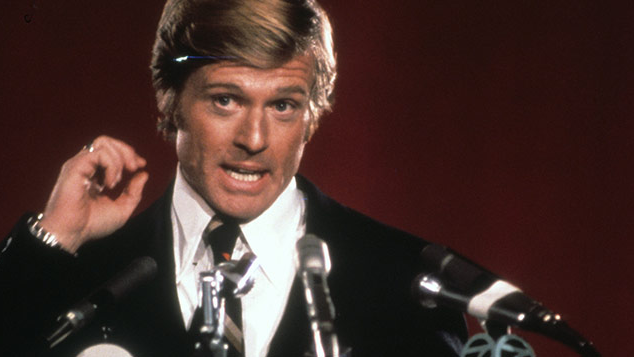 Robert Redford stars as the titular candidate Bill McKay. Bill is a small town California public interest lawyer working out of a ramshackle legal aid office. When professional campaign organizer and manager Marvin â€œLuckâ€ Lucas, played by Peter Boyle, sees McKayâ€™s photo in a magazine during the concession speech at his latest failed venture, Luck sees a story that voters could get behind for the next Senate race. The contest will be against the typical-est establishment fart you could fabricate from tawdry beltway cloth. Crocker Jarmon, the Republic incumbent played by Don Porter, has a disingenuous smile, a noncommittal handshake, and a soporific lilt in his speech. Yet, for reasons the film never quite pinpoints (nor, as a simple matter of plot, does it ever really matter all that much), Jarmon is quite an unstoppable campaign opponent. McKay is not so unfamiliar with the establishment himself, however. Although the two share a frosty relationship, Bill is the son of vaunted former Governor John McKay, played by Melvyn Douglas. Bill places only two conditions on his acquiescence to Luckâ€™s entreaties to run: he gets total freedom to say what he believes, and he refuses to involve his father in the campaign. Before two hours elapse, Bill will break both promises. 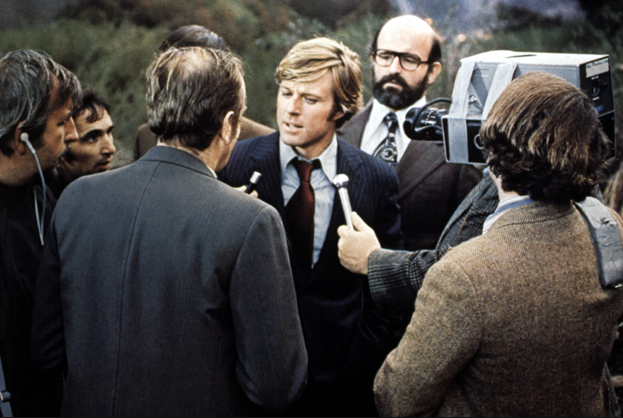 While The Candidate is, at its core, not an abrasive or mean filmâ€”the characters each have a charm about them that ranges from the suave and approachable (Redfordâ€™s go-to, evident here, too) to the bumbling and hapless (Boyle) to the bloviating-but-well-meaning (McKayâ€™s media relations guru)â€”but it is very, very cynical. McKayâ€™s compromises come first only surreptitiously, in a conversation about what kind of commercials, haircut, and suit will best â€œsellâ€ his handsome face to the voters. For the time being, this is nothing too serious to rattle McKayâ€™s integrity; as long as he can stick to the issues and appeal to the voters, he feels like he hasnâ€™t jeopardized his original intentions. But eventually, McKay succumbs to the forces that inevitably sweep up even the most innocent candidate: chasing pollsters means he needs to switch message; chasing funders means he needs to solicit unwelcome company; chasing media moments means he needs to capitalize on tragedy to acquire a spotlight (in reference to a forest fire in Malibu, his aide excitedly claims â€œitâ€™s perfect!!â€). By the end of the film, McKay has but a brief moment of clarity at the end of a televised debate against his opponent, where he bemoans that heâ€™s not really addressed the issues that matter to him throughout the campaign. But by that point heâ€™s already gone too far: heâ€™s showing up to meetings late, accompanied by an adulating groupie; heâ€™s lost sight of what heâ€™s advocating for; and, echoing the same bewildered look on Dustin Hoffmanâ€™s and Katharine Rossâ€™s faces at the end of The Graduate, McKay feels completely out of his depth upon achieving the very thing he wanted. Previous Previous post: How much damage could Donald Trump really do, after all?